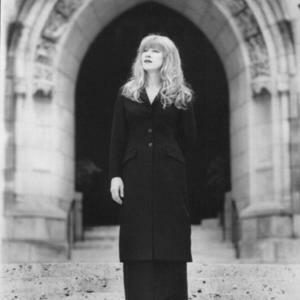 Canadian singer and composer Loreena McKennitt is self-managed, self-produced and head of her own record label - Quinlan Road. In a recording career spanning three decades, McKennitt's ?eclectic Celtic? music has won critical acclaim worldwide and gold, platinum and multi-platinum sales awards in fifteen countries across four continents. Her most successful record is 1997's "The Book of Secrets", which spun off the single "The Mummers' Dance", a surprise hit on American Top 40 and alternative rock radio. McKennitt blends world-music with folk, Celtic and exotic Mediterranean sounds using instruments such as the hurdy gurdy, kanoun, uilleann pipes, Turkish clarinet, bouzouki and nyckelharpa alongside traditional instruments like guitar, drums and bass and the harp, piano and accordion, the three instruments she plays. Born in Morden, Manitoba, Canada in February 17, 1957, Loreena moved to Stratford, Ontario, Canada in 1981, where she still resides. She has acted and sung in, and composed music for, Stratford Festival of Canada productions ranging from The Tempest (1982) to The Merchant Of Venice (2001). Her recording career began in 1985 with the album Elemental. In the fledgling years of her label Quinlan Road, Loreena ran its operations from her kitchen table, selling recordings by mail order and producing her own concert tours across the country. Quinlan Road's catalogue is currently distributed around the world by Warner Music (US), Universal Music (Canada and other territories including Italy and Spain) and a number of independents including Keltia Music (France) and SPV (Germany).